Powers/Abilities: Creech controlled an army of truly evil waxworks, that acted much like the evil people they were based on. 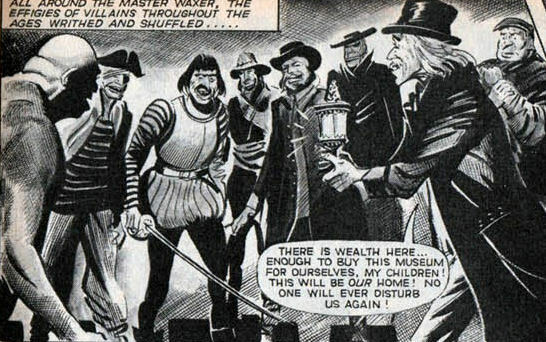 The waxworks themselves, while capable of independent thought, were normally totally subservient to Creech, although a duplicate he made of his nemesis Mike Masters fought his control. History: Septimus Creech was the curator of a waxwork named 'The Palace of Villainy', which he populated with effigies of villains from throughout human history. But Creech had a secret: he could bring his evil creations to life to carry out his bidding, though only during the dark hours between midnight and dawn. Using his creations he committed a variety of crimes, drawing the attention of former constable Mike Masters. 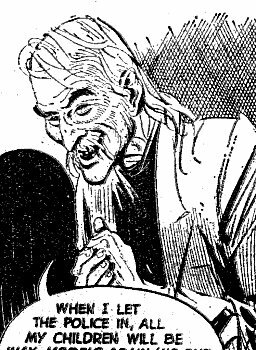 Comments: Interestingly, Septimus Creech shares an unusual surname with the leader of the White Eyes, Ezra Creech, another villain from Lion Comic. Perhaps they were related?